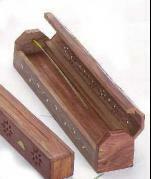 Perfect for burning incense and somefolks even store small items in them. Size is 11 1/2" X 2" X 2 1/4" high. All wood, very nice looking. Each one is hand made. Some have inlay in them.